New Blog Project: The Sauce! The Sauce: No transit updates. Just beer and liquor near LA Metro. It is a project I have been thinking about for the past several years and my move to Los Angeles afforded me the opportunity. The site is devoted to bringing Los Angeles residents and visitors a list of great bars and clubs easily accessibly via LA Metro bus and rail service. Better yet, it is provided by those who know how to navigate a transit system on their way to alcohol: urban planners. The database at present includes five bars in the Los Angeles area and will be adding more soon! Readers are encouraged to provide their own reviews of their favorite transit-accessible bars and clubs. So have at it! Please visit my new site and enjoy the reviews. And for your next night out, make sure to enjoy the uncomplicated benefits of public transit. Know Metro. Love Metro. Go Metro! Disclaimer: All views expressed in the blog, The Sauce, are solely those of the authors. The Sauce is in no way affiliated or an official project of the Los Angeles Metropolitan Transportation Authority or the blog, The Source. I have a Yelp account and love trying places and writing a review about it later. It’s one of my nerdy guilty pleasures. This blog was never set up to serve as a supplement to my Yelp account. However, walking back to my apartment today I stopped at a hamburger stand who’s distance can be measured in hundreds of feet away from my front door. 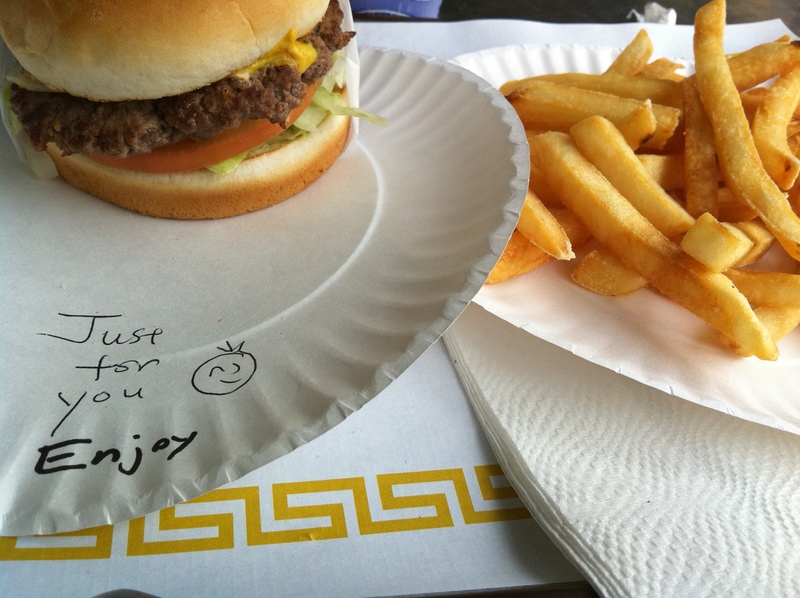 The Place is called Irv’s Burgers and, at a risk of over-selling this… it is the BEST hamburger joint ever!!! Now, before any of you local foodies comes screaming at my blogger door, I admit I am exagerating just a tad. I’m sure we could find a burger with a little more flavor and who can really argue with the foie gras burger? But so much more goes into a “hamburger stand” than just the burger itself. Irv’s is an epic win; a hamburger stand serving up some real tasty burgers and fries at a decent price and the service to boot. Less than will not only $8 gets you a cheeseburger, fries and a coke but the rediculously nice staff working the stand itself. When I arrived there was one man ahead of me. But the woman at the counter, pictured in the far left of the photo here waved and said “hello” to me with a big smile on her face. The man in the photo took my order. Another equally happy person who just seemed rediculously thrilled to be working the stand and thanked me for coming and placing my order. He also brought out my food as well. When my innocent looking plate arrived, I almost immediately began to rip open the paper wrapping my burger when my eye was pulled in to a most unusual print on my plate. At first I thought there was some kind of smudge on my plate. But wait… that’s not dirt. It’s a message. Sweet Jesus, had all this time of eating meat; killing one innocent animal after another for the benefit of my taste buds caught up to me? Was this a poltergeist of the bovine kind? No! It was “thank you” message. No Really. Written on my innocent hamburger holding vessel was a note from the staff: “Just for you. Enjoy! ^_^” I was so taken back by the diabetically induced sweetness of the message that I didn’t eat the burger for a good sixty seconds. Once I got over that I later did to discover was this not only a very friendly and happy establishment but a place that can serve a tasty burger. Great proportion of meat, toppings and bun and the fries were served fresh and hot. Mmmmm…. 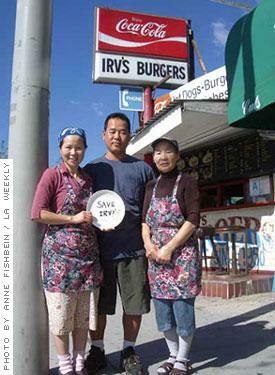 I strongly recommend Irv’s to any burger lover in Los Angeles or anyone visiting. Whether locals like it is beside the point. This type of stand and this type of service is so rare in any part of the country that to even fathom it in a place like Los Angeles (WeHo) is astounding and special. The staff working here are so nice and so clearly happy and in love with the stand and their work that no matter what you are doing and no matter how much you love or hate your job, you can’t help but feel that your job is not nearly as rewarding as theirs. This is the kind of place that is truly worthy to be preserved. We so often get bogged down in counting the years of a place as a qualifier for preservation. But what we should not forget is that preservation is not simply to remind us of what we once had but to help us feel good about where we are going. I don’t know about you, but I felt really good about myself after having a burger at Irv’s. Only thing that could have made it better was if I was given a little gin and vermouth. I, Roobs, hereby declare Irv’s the BEST hamburger stand EVER! Irv’s, for the win!